Adam Ant dropped in at the Ace of Spades, Sacramento: one-more stop on his mega-USA tour, which began in San Diego on 17th July and has been zooming around the USA ever since, close to one show a night, more than forty cities, (I'd be dizzy by now), and which will be completed when he performs in Las Vegas on September 20th and Anahaim on the 21st. He's appeared on Jimmy Fallon. He's already toured the UK this year, and has dates in Germany in early 2014. Many chances for fans old-and-new to see the man who was always a much more charismatic pirate and popular hero than Jonny Depp will ever be. At least where I came from. The tour follows the release, in January this year, of Adam's first album since 1995: "Adam Ant is the Blueback Hussar in Marrying the Gunner's Daughter". Mouthful of an album title, that one. Try saying that three times in a hurry. Adam performed one of the songs from the new album, "Vince Taylor", on Late Night with Jimmy Fallon on 15th July. If you missed it, you know where to find it. Then Adam took the stage... and that outfit, that stage persona, are so very, very cool. The slightly-dissolute, highwayman-pirate-court-jester, the skull-and-crossbone buttons, the feathers in the hat and the cross on his cheek. The way he spins and twists around the stage. The way he runs one song after another, without a break, without a pause, until the crowd yells for more and he tells the story behind "Wonderful", sings it, and then tells the true story... well maybe the true story! The venue was not filled to capacity, but those who were there were so appreciative it made up for those who went missing last night. Fans young and old(er); many with facepaint and Adam-esque outfits, a few tricorn hats, and lots of cheering. Yes, all generations are allowed to dress up for a night out! 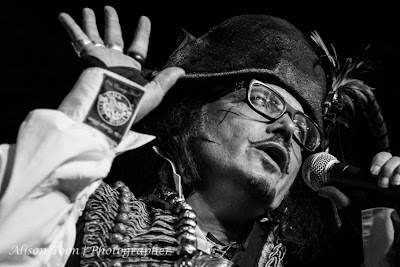 Adam Ant's 2013 show is the show of a current artist--not just someone relying on, and replaying, their past glory (though it was good to hear the classics). Check out the new album and listen for yourself. (Revising and researching before a show takes you down some interesting memory-lanes. This time, it was Boz Boorer, guitarist and producer, whose collaboration can be heard on Adam Ant is the Blueback Hussar in Marrying the Gunner's Daughter". Adam Ant to Boz Boorer to a mention of The Polecats! The Polecats! OMG moment... hadn't heard that name in years. Rockabilly! And apparently still alive, kicking, and touring. Wonder if they'll drop in to the Ace any time soon?) The Ace of Spades always does a great job with the music before-and-between the acts: last night was pure rockabilly. Happy, makes-you-want-to-dance, rockabilly.